FFD M embers participating in Saturday’s Christmas Parade. L to R: Phil Via, Arun Pant, Ted “Tadpole” King, Connor Woodring, Zak Hromanik, Brie Lyons, Dale Bladen, Harry Foor, Kelly Frye, Bill Price, Sam McCulloh, Gary Beachy. 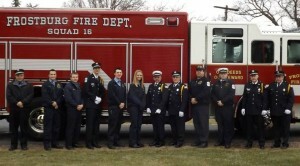 Units in the procession were T16, SQ16, and E164.